Tata is all set to launch its latest offering for the Indian market, the Nexon compact SUV. The Nexon will take on the likes of the Maruti Vitara Brezza, the Ford Ecosport and the Honda WR-V. We’ve now driven all four vehicles. Here’s how the Nexon feels relative to its main competition. Take a look at all four, and you will agree that the WR-V looks the biggest. Mind you, we are talking about what they look like – not exact sizes. After WR-V, the EcoSport, Nexon and Brezza follow in that order. While differences in length are negligible, in width, the Nexon is the widest, followed by Brezza, EcoSport and WR-V in that order. Having a sub-4 meter compact SUV (or mini crossover, call it what you will) is all about having a vehicle that has good street presence. Honda has given it plenty of cuts and creases to make it looks very substantial in the flesh. Because of this, the WR-V has quite a bit of street presence.. The Brezza’s squarish looks and tallish stance give it decent presence on the road, but it doesn’t really look butch enough. While the Ecosport looks small, it does have the traits that make you think this is a proper SUV – a high bonnet, and muscular wheel arches. The spare tyre mounted on the hatch lid certainly adds to the SUV feel of the Ecosport but overall, it looks like a tall hatchback. Coming to the Nexon, while it has the width and a high bonnet line with curved fenders to make it look like an SUV, but it’s not tall enough. This makes it look smaller than the others on the road. Thanks to Honda’s packaging, WR-V feels the biggest inside. Next comes Nexon, and third and fourth are brought up by Brezza and EcoSport. In terms of space, the WR-V has the most room on the inside. While the Ecosport happens to be the longest, it has the least room inside while the Nexon has adequate room on the inside, and has the second-best leg room among the four, even though it isn’t the biggest. The Brezza comes in between the Nexon and Ecosport. It’s roomier than the latter and offers more headroom than the former. On the inside, the Nexon is the one that has the most modern cabin. It has a standalone 6.5″ touch screen unit which supports Apple Carplay and Android Auto. It also gets Harman infotainment system, LED tail lamps and LED DRLs, driving modes (Eco, City, Sport) which actually change the ECU characteristics, keyless go and it even gets the wearable activity bracelet key, something that you see on higher end Range Rovers and Jaguars. The Brezza is the second most equipped in this segment, getting auto headlamps, LED DRLs, Smartplay infotainment system with navigation and Apple Car play and colour changing instrument cluster. The Ecosport gets 6 airbags and now offers a touch screen system on the top of the line model. The WR-V is well loaded too. It gets the rear camera, a sun roof, LED DRLs, a touch screen system with navigation and Mirrorlink (no Android Auto or Apple Car play) and it also has wi-fi capabilities. Highway: Among the diesel variants, on the highway, EcoSport is the winner as it is the best handling among the four, thanks to low amounts of body roll. With low turbo lag, the 1.5 liter TDCI diesel motor (98.6 Bhp-205 Nm) is a willing performer too, not losing steam until well over 100 Kph. The next in order is the Nexon, thanks to its 6-speed gearbox and powerful 1.5 liter engine (108 Bhp-260 Nm), followed by Brezza (1.3 liter, 89 Bhp-200 Nm) and WR-V (1.5 liter, 98.6 Bhp-200 Nm). City: The WR-V feels the most responsive due to the near absence of turbo lag in the 1.5 liter i-DTEC diesel engine in the city. The Ecosport comes in second place with minimal turbo lag, and the Nexon is edged out to third. The Brezza, with significant turbo lag, feels least driveable among the four in the city. 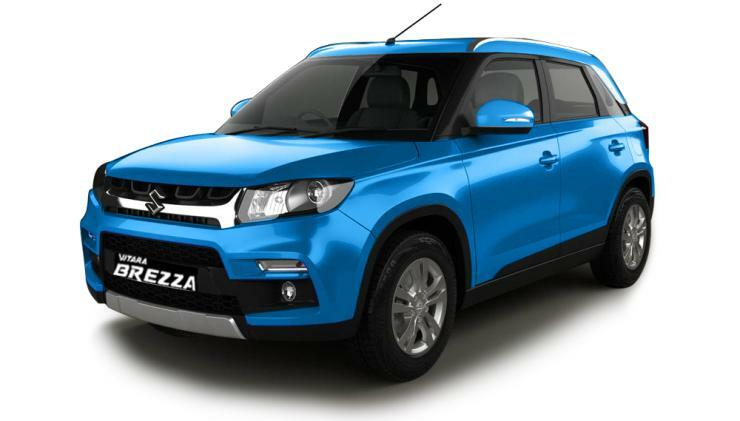 City: Coming to petrols, the comparison is narrowed down to three cars as the Brezza is diesel-only. Here, the Ecosport’s 1 liter EcoBoost turbo petrol motor (123 Bhp-170 Nm) feels the strongest, making the Ford a clear winner. Moreover, the Ecosport can also be ordered with a 1.5 liter petrol engine (108 Bhp-140 Nm) mated to an automatic gearbox, and this again makes this vehicle the best bet for city driving. The Nexon takes second. Tata first-ever 1.2 liter (108 Bhp-170 Nm) turbo petrol engine has big turbo lag, which makes it a handful in the city, but the torque when it comes in makes the vehicle reasonably peppy. The WR-V Petrol comes last. Its 1.2 liter naturally aspirated petrol (89 Bhp-110 Nm) suffers a poor low end and really needs to be revved to get going. This makes city driving a chore, especially since the car doesn’t have an automatic gearbox option. Highway: Again, it’s the Ecosport that is the winner on highways too, with the EcoBoost motor a willing performer. The Nexon does decently, and comes in second place, as the 1.2 liter turbo petrol engine has a lot of poke once the turbo spools up. The WR-V is much weaker than the two others in terms of torque, and this shows up on the highway. It finishes last. The WR-V offers a sun roof, which is something that a lot of people have been attracted by. The car is also very roomy on the inside and quite practical. For Honda fans, the car ticks all the right boxes. The Brezza is a good overall vehicle, however it can only be had with a diesel engine. It is roomy, decent to drive and is well loaded. This vehicle is a good compromise that offers a bit of everything. The Ecosport is due for a change really soon that will see it get updated interiors. This is the one that is the best handling vehicle of the lot. Overall, the Ecosport is the most involving to drive. The Nexon on the other hand is a fresh offering that is well loaded, looks unique is quite engaging to drive. If Tata prices it well, it could well turn out to be a good seller. Over to the price announcement for now.